England World Cup-winner Mike Tindall's retirement from rugby has not lasted long. While his former Gloucester team-mates were running out against Sale in the Aviva Premiership, Tindall enjoyed a cameo for Devon Tribute 2 side North Tawton. 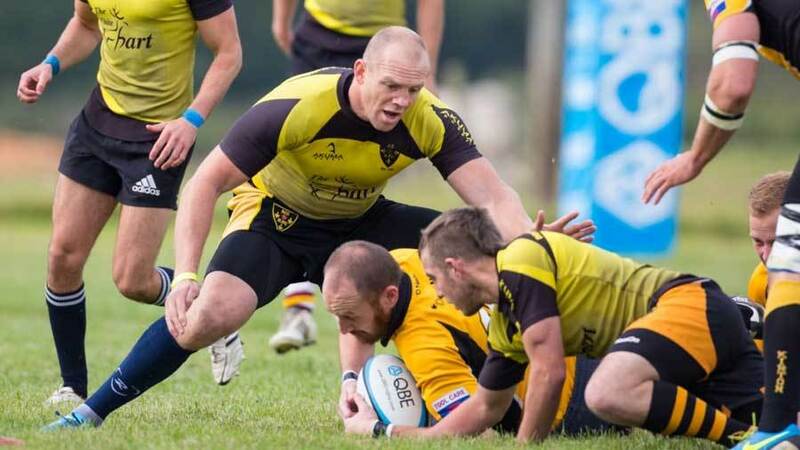 Tindall, who took part in the match as part of a role in QBE's hit squad initiative, was part of North Tawton's backroom staff for their match against Crediton RFC. But his itchy feet proved too much and he enjoyed a run out in the second-half at fly-half. He set up two of North Tawton's four tries and helped his team to a 26-17 triumph. "Since retiring I have been biting at the bit to get back on the pitch," Tindall said. "I didn't come here expecting to be involved in a playing sense but the players and coaches were keen on the idea. Clubs like North Tawton and Crediton are at the heartbeat of their local communities and it has been great to be part of grassroots rugby in both a coaching and playing capacity. "Make no mistake; today was by no means easy. I had a lot of big Devon lads running down my channel and I have the bruised ribs to show for it." He lined up against Crediton's Gareth Quinch who was in awe of his opposite number. "This sort of thing never happens for an amateur rugby player playing in the deepest depths of Devon," Quinch said. "We heard rumours Tindall was going to be there today but I never once expected him to be playing, let alone line up as my opposite number. It was a once in a lifetime opportunity but the most nervous I have ever been during a match for sure."